The only thing as good as an evening with a great friend is an evening with a great book. As Galentine’s Day returns, there can be no better gift to give your favourite people than a book that celebrates the incredible bond between female friends. 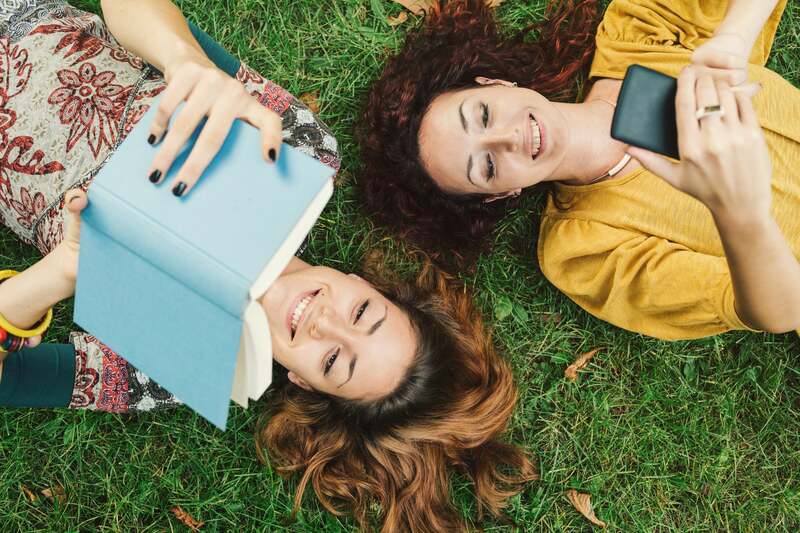 From tales of young girls who cling to each other as they navigate coming of age, to odes to the persistence of imperfect female bonds which can save you from a lifetime of misery with the wrong person, friendship is a rich tapestry of passion, loyalty and commitment that has formed the bedrock of countless literary subjects for centuries. We asked our colleagues and friends to recommend their favourite books about the joy of female friendship so if you’re still looking for a last-minute present to give to your girlfriend for Galentine’s, look no further. This four-part series by Italian novelist Elena Ferrante follows the lives of two women, Elena and Lila, who grow up together in a poor neighbourhood on the outskirts of Naples, Italy. The series begins with My Brilliant Friend, in which Elena is in her sixties and finds out her childhood friend has disappeared. She then begins to write down everything she remembers about Lila, and what follows is a sprawling story of a decades-long friendship. Rooney’s first novel was published in 2017, when the author was just 26. It tells the story of best friends and exes, Frances and Bobbi, and sees how the introduction of new people into their lives affects their friendship. Packed with astute observation about female friendship, relationships and inner monologues, this book will have you want to call your girlfriends and immediately recommend it to them. So beautiful are the depictions of these female characters that the book earned Rooney the title of “voice of a generation”. A must-read for women in their twenties. Lily Pebbles bucked the influencer trend of creating lifestyle books full of Pinterest-worthy imagery and minimal – and often ghostwritten – text. Instead, The F Word is billed as “a personal exploration of modern female friendship”, but it really functions more as an ode to her own friends, which is no bad thing. It’s an uplifting read that will make you value the women in your own life. For the young adult fiction lover in your life, Sara Barnard’s debut novel is a great option. Unlike many stories featuring teenage girls, it doesn’t fall into the trap of centering their romantic exploits. The idea of a friendship between two main characters being put to the test when a third person enters the fold is not new, but Barnard tells it as well as anyone. It has intrigue and charm and you can probably read it in one sitting. This 1962 postmodernist novel is written as fragments of protagonist Anna Wulf’s writings about her life, which she records in four different coloured notebooks and then weaves together in the golden one. This creates a non-chronological narrative of her friendship with Molly Jacobs, as well as the men who enter and leave their lives. In 2007 Doris Lessing was awarded the Nobel Prize in Literature, which she added to her many accolades. A book for the friend who enjoys great works of fiction. It would be remiss to write about female friendship without mentioning Judy Blume, who popularised this theme in YA fiction in the 1970s with classics such as Are You There God? It’s Me, Margaret and Just as Long as We’re Together. Summer Sisters is adult fiction, even though it begins with flashbacks to main characters Caitlin and Vix’s childhood, and their first encounter in sixth grade. Throughout the novel, which spans decades, their friendship is tested over and over, but eventually proves to be more resilient than any romantic connection the characters make over the course of their lives. Zadie Smith’s fifth novel, published in 2016, Swing Time has been compared to the aforementioned Elena Ferrante series for its centralisation of the friendship between two young, working class women, although Smith begins the books in London as opposed to rural Italy. The unnamed narrator and childhood best friend Tracey go through a lifetime of struggles which test their friendship and their convictions, to a backdrop of scathing social commentary. Not always uplifting, but definitely an enriching read. If The F Word was a celebration of the author’s friendships, The Friendship Cure is truly and exploration of what friendship means, and the power it can have. Kate Leaver’s book is based around her hypothesis that friendship can be the solution for many of the problems facing us in today’s world. Thoroughly researched and peppered with extraordinary stories which will leave you more appreciative of your friends than ever, this is a perfect gift for your more existential friends. Set in Kabul, Afghanistan, against the backdrop of political turmoil, the 2012 novel centres around a small coffee shop where the owner, American-born Sunny, meets four other women from different backgrounds who all come together and form a unique friendship. The book follows their lives, struggles and experiences in a poignant story that manages to create a world of kindness and possibility within a harrowing warzone. Famously adapted into the 2005 film of the same name, this series follows the lives of four teenage girls whose friendship is cemented by a pair of jeans that miraculously fits them all perfectly, despite them all having different body types. The novels are accessible and light but touch on powerful coming-of-age moments, in with the trousers become a symbol of the girls’ individual strength and interconnected bond. Give this book with a pair of jeans for the ultimate gift. The story follows Emerald, a young woman who works as a waitress by day but as part of a powerful crime-fighting coven by night. The book follows the women’s journey to take down a man who burns women alive – but it’s not as dark as it sounds. The women draw strength from each other and their friendship which allows them to protect the people they love. This is an ideal gift for any Sci-Fi lovers in your Whatsapp group. Anzac Day 2019: When is it and how is it marked in Australia and New Zealand?